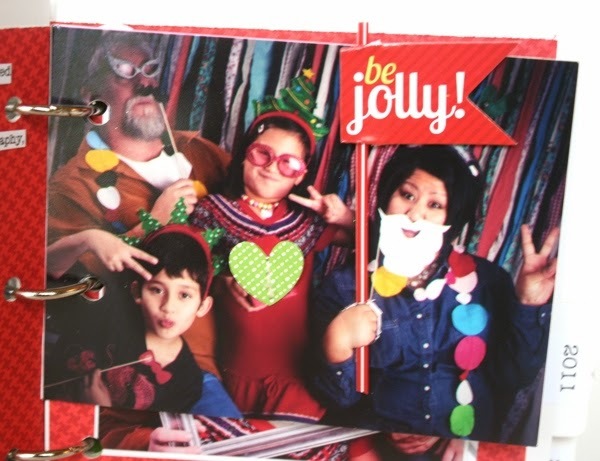 One of my very favoritest parts of Christmas are the photos --- namely our family photo that makes its debut on the cards we send to family and friends. 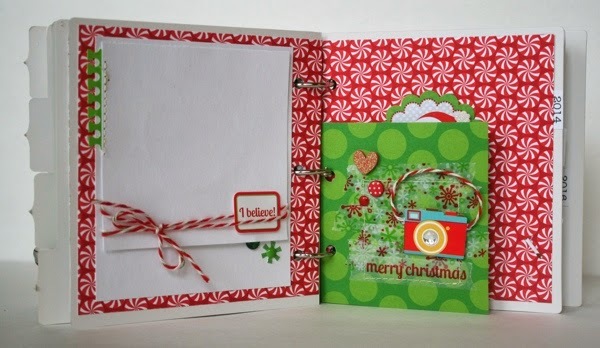 I put them all together in this cute little mini album, using a mix of board bases from doodlebug design. 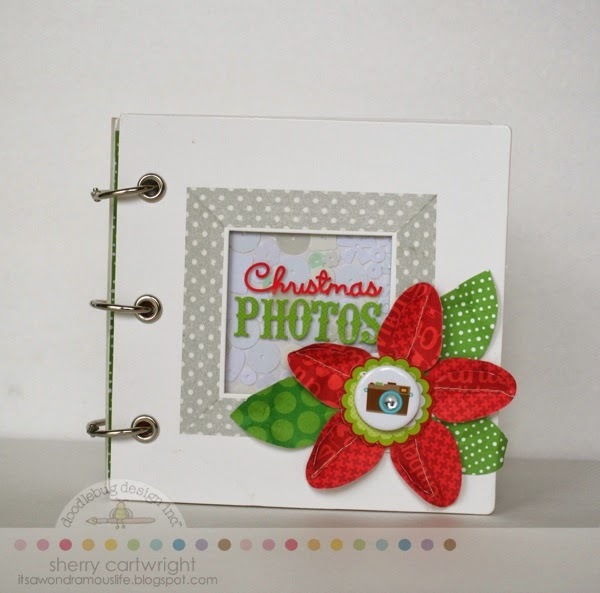 I used a camera doodad to focus on the photo portion of this mini album. 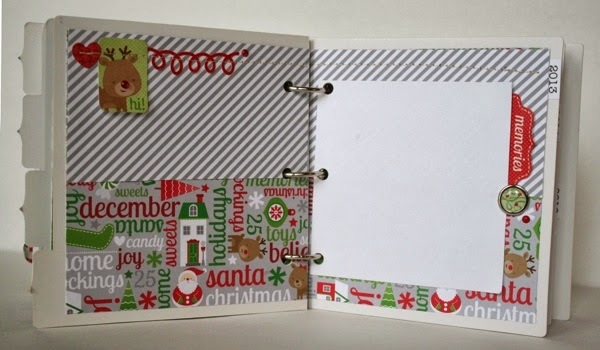 Then, I used the home for the holidays collection on each page. 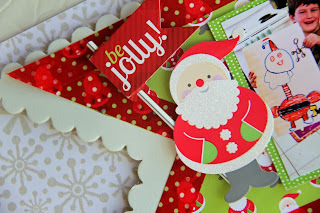 I love the patterns of this collection, along with the mix of grey with red and green. LOVE. I also layered two board bases together, using foam adhesive tape to separate the layers. I piled in white sequins behind a plastic sheet. I just like how it reminded me of a camera and the tone-on-tone textures is awesome. 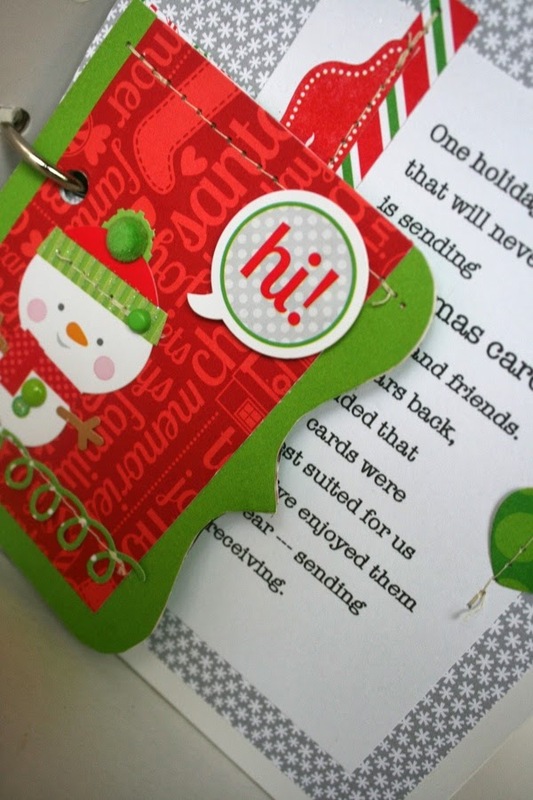 The opening page is this cute snowman, welcoming you to our book of memories. 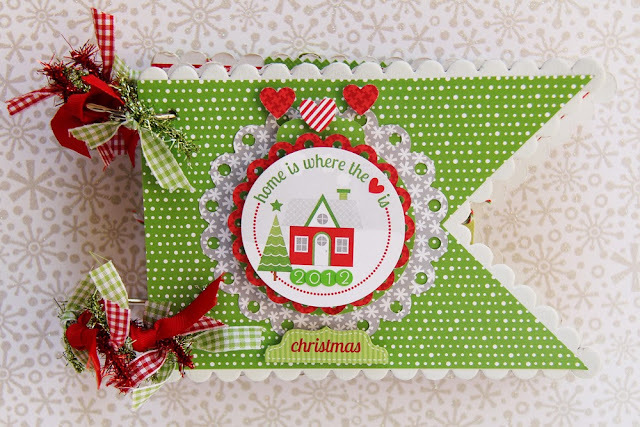 I covered a shaped board page with patterned paper, then added stickers, brads and sprinkles. 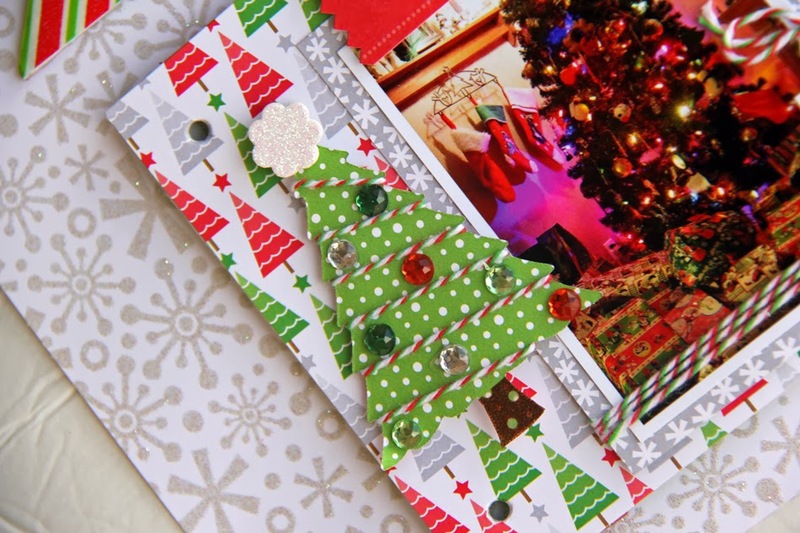 One holiday tradition that will never grow old is sending Christmas cards to family and friends. A few years back, we decided that photo cards were the best suited for us and we've enjoyed them each year --- sending and receiving. This is by far my favorite photo and page --- both came together very easily. The K-girl was trying to kiss her resistant brother and it looks like she is strangling him. Not funny, but it captured their personalities so well. 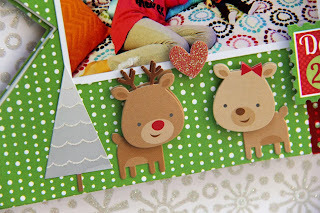 Velvet letters and banner alphabets are perfect addition to this page. 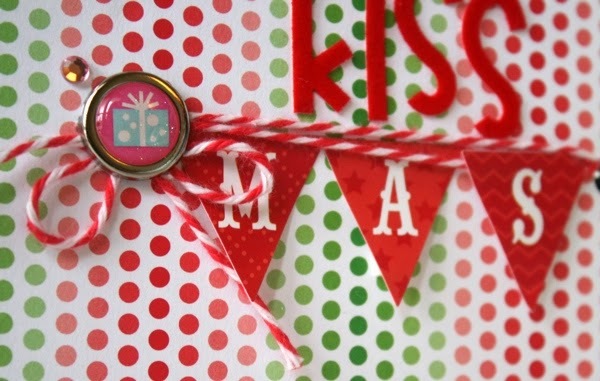 The present brad was from several years back, but works so well with the touch of pink in the patterned paper. 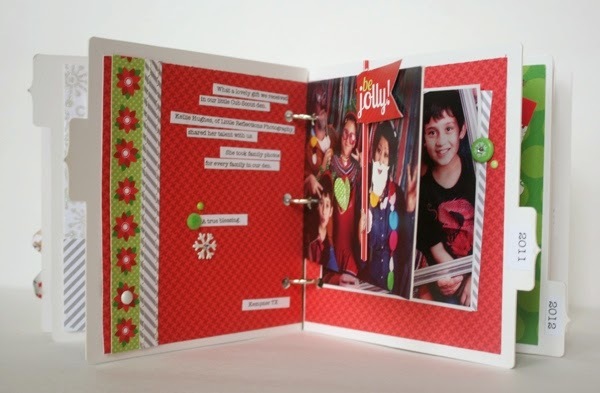 The almost-center page is a smaller page and features two 4x6 photos from a photobooth session with our Cub Scout den. I cut my hand in the photo to "hold" a pixie and added a pennant. 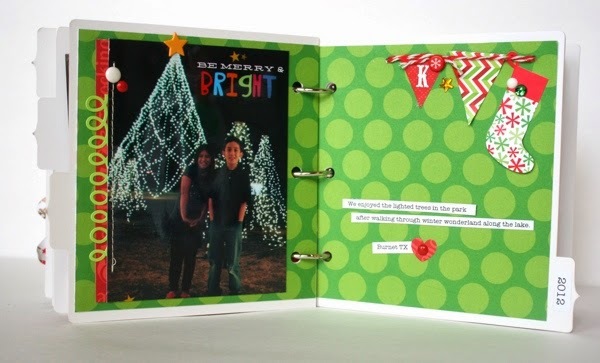 Our cards are printed 4x6 and are just perfect in this mini album. 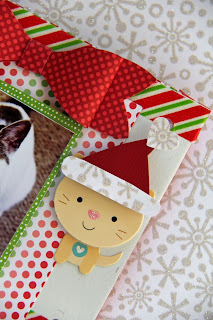 I stitched a fancy frill sticker between the patterned paper and the photo. Up to this point, our photos have already been taken. This is a blank page for this year's photo. Sure, I'm not sure what it will look like since we've not taken it yet, but it will work perfectly, I just know. I cut the top of the tag off to make it a banner. 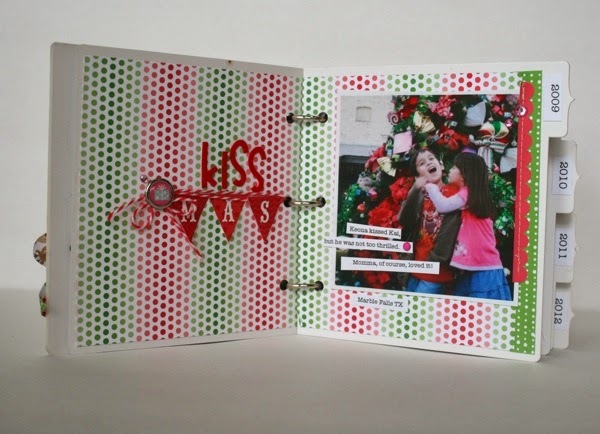 Super simple page for 2014 --- photo on left with doodletwine and the right page has a circular Santa sticker. The smaller page in between these two was created by using pattern paper as the background, then layering it with washi tape of snowflakes and Christmas text. I stitched a square over the tape and added the camera, to once again depict the phototaking of this album. I love that the book is already ready created and all I have to do is add this year's photo [and a photo from 2014, 2015 and 2016]. 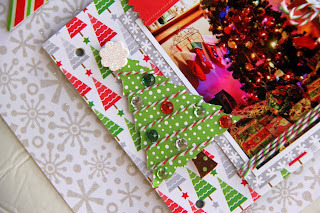 Have you created any Christmas albums this year? I'd love to see them. These are so cute! 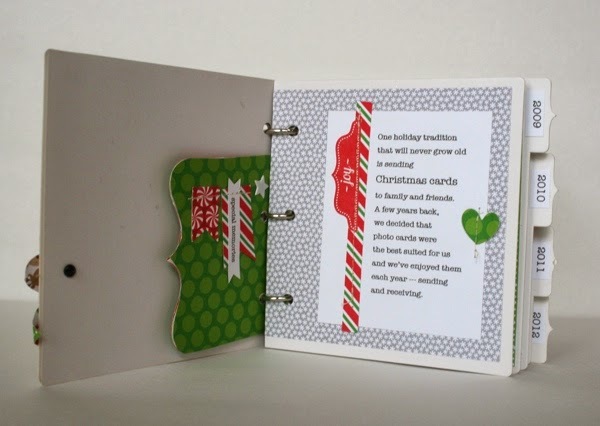 I always want to save our photo Christmas cards to remember what they looked like each year. It's fun to send them out to people, but it's also fun to look back at them and how everyone has changed over the years!